The Ingenico ICT 250 is a countertop terminal ideal for most retailers. This terminal is capable of connecting either using Dial (or telephone) connection of over the Internet (connector to a router or modem). 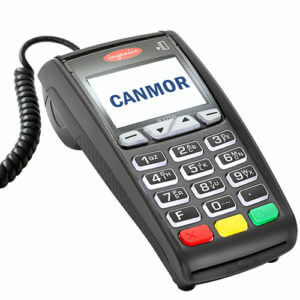 Unlike the ICT 220, this terminal accepts Contactless transactions such as “Tap and Go”, Interac Flash, and any other applications that uses Near Field Communication (NFC) such as Apple Pay. All Retail businesses Clothing, Hardware, Hairdressers, etc. Automotive – Dealers, Repair Shops, Body Shops, etc. Professionals – Doctors, Dentists, Accountants, etc. Markets – Mini Markets, Convenience Stores, etc.